This hostel is in a great location as its less than a 2-minute walk to a beautiful beach. 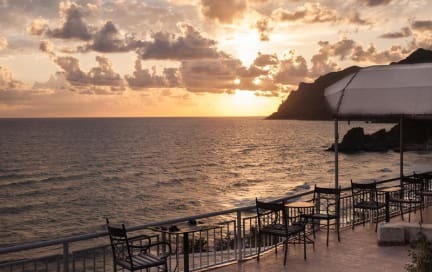 It provides a very relaxing atmosphere with lots of space on they're large terrace which provides a very nice view of the sea, especially at sunset. The breakfast and dinner that they provide whilst you stay are of a very high quality and more than enough for the price you pay to stay. Overall I loved my stay here and would definitely recommend staying here. I will be returning as soon as i can. Very peaceful place on the beach, great to relax! The atmosphere at the hostel is just lovely - with the communal dinners after sunset and the friendly staff, it's easy to feel welcome. My friend and I stayed in a private room rather than a dorm, 100% worth it! The views and beach are amazing. I ended up contracting mono on my trip, and Magdalena was nothing but helpful and maternal - she gave me medication, food she thought would help, and arranged for me to get to the hospital on the other side of the island. Thank you so much! Incredible view by the tbalcony, they make us dinner and breakfast wich was really nice. Only stayed one night. The place is a little isolated but usually theres enough people in the hostel during the night for a few drinks. The room could use some air conditioner or at least some fans. Really hot during the summer. I was looking for a budget place to stay on the Corfu island for 4 nights on my free weekend. I booked Sunrock mainly because of location: 1) located on the west coast, so I could enjoy beautiful sunsets, 2) accessible with public transport also rather late in the evening. The other reason was included meals that are good enough, especially dinner. Room and bed was clean. No fridge, water boiler and security lockers for guest use. These basic amenities would be a great improvement! Amazing view, close to the beach, traditional food cooked directly by the owner, also very nice breakfast choices. The staff is very friendly and helpful, and the transfers are also very flexible and convenient. For the hostel rooms, the shared bathroom is just not that great, gets dirty very quickly, and the rooms dont have fan or airco but at night it cooled down so it was bearable. Also very convenient, the scooter rental! ...take into consideration the very steep road down to the property. Although on the other side of the island to the main town, Sunrock is a lovely idyllic hostel. 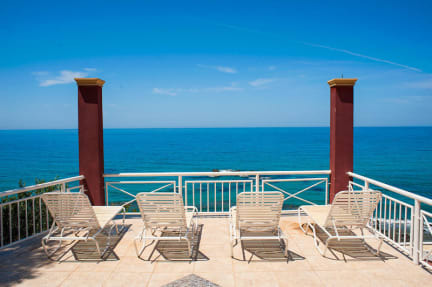 With the beach, the balcony and the free breakfast/evening meal, it’s a good value for money. The only downside was that it’s a very steep walk up a hill to get the bus if you want to go to the main part of the island but the buses are hourly and very on time! Bathrooms could have been cleaner but altogether I really loved it there! Rooms remain open and no key is given to anybody. Even when Corfu is really safe, it would be appreciated to get at least rooms closed. Breakfast and dinner is included and it is great. Dinner depends on the day, I had bad luck and it was not as tasty as some previous nights (according to some other travellers). It is a great place to meet people. The location was good, at the bottom of the hill, next to the beach (as all accommodation if you choose Pelekas Beach!) Great views. Great location. Standard double bedroom is basically a box (I mean a big white box - nothing like the pictures). They really need to hire a cleaner. Rundown and rather dirty place. The quality of the included dinner is questionable. In general the owner doesn't seem to appreciate the visitors of the hostel to much. Wouldn't go there again.